Rock climbing is a sporting activity where a person climbs rock formations in several directions. Usually with some suspenders or other sophisticated gear. This sport is not only exhilarating. It is also quite dangerous. That reason is why your require years of practice before even beginning. That is something that is vital to understand. Rock climbing is a crucial test of mental endurance and patience as well as physical strength. That is a trait combination that not everyone is great. People have been amusing themselves with this sport for centuries. Nevertheless, the refinement in tools and ropes is something new. The inception of this extreme sport can be dated back to the 15th century. As even then people were fond of climbing various rock formations for the sake of fun or an adrenaline buzz. Gradually, people started to pick up on the trend. And it became more than just a hobby for some as they began to pursue it for a purpose. Antoine de Ville is one of the most notable climbers. For example, he is one of the earliest individuals to climb a mountain and various rock formations. Moreover, with the essential tools and mostly his hands. His ascension on Mont Aiguille started a movement of sorts. Likewise, rock climbing became more popular and generated fans following shortly after. Gradually the craze for various extreme sports took off. Also, people started to chase several adrenaline pumping activities even more. Imagine the intensity of climbing a mountain with virtually fundamental tools back in the 18th century, with no guarantees of making it out alive! The sports enthusiasts started to become more engrossed by challenging themselves. Thus the year 1786 can be termed as the beginning of the ‘modern mountaineering era’ instead of the works of Jacques Balmat and Michel-Gabriel Paccard. They used somewhat advanced tools for their ascent onto the Mont Blanc. Moreover, their legendary climb of 15,771 feet was an iconic progression in the field of mountain climbing. By the early 1900s, countless people jumped on the bandwagon and started to explore the dangerous sport. The century was already blossoming into an industrial era. Consequently, the climbing tools were better in refinement than ever before. With the ease of using this innovative and new equipment brought, the sky was the limit for countless adventure seekers around the world. The year 1910 was when people gradually became better in this sport and started handling the equipment with more finesse. As it was an innovative era, some successful experiments were leaving an indelible impact on the rock climbing avenue for years to come. Emilio Comici is a notable name for his invention of the multi-set ladder and belays during this time. These inventions became a vital part of rock climbing in the future. Even though the sport was quite vigorous, it was not until the 1950s that they officially recognized it as a sport other than mountaineering. Given the similar genre of sports, it was easy to confuse the two up. But the raging recognition of rock climbing gave it some well-deserved fame. During the 1960s and the 1970s, Yosemite Climbers once again restored the concept of free climbing. The limited climbing aids further exalted the level of enthusiasm for this extreme sport. Finally, after the 1980s rock climbing suffused through the globe and countless people started chasing this activity. Whether for strength building purposes or improving the body flexibility for gymnastics, rock climbing was now a world-renowned sport. People have taken up challenges like never before to pledge their dedication to the sport and the number of expert rock climbers soared in the 21st century with unmatched intensity. It is intriguing how much this sport has to offer to its countless followers. The variation of rock climbing overtime shows how much potential there is in this avenue. Whether you are into extreme agility enhancing tactics or just some novice level nature engaging activities, rock climbing is the umbrella under which you can merely pursue everything! As the name suggests, this is the standard most way of engaging in the sport. Traditional rock climbing is all about simplicity and following this passion for the sake of fun. There is hardly any complexity in this type of rock climbing as it focuses on the most generic and raw form of rock climbing. Here the climber will use the full essential gear which is generally attached to the rock first to harness. Even though this might sound relatively easier and look simple thanks to its popularity in film scenes, traditional rock climbing also demands years of practice which is why people generally join a club to brush up their skills. 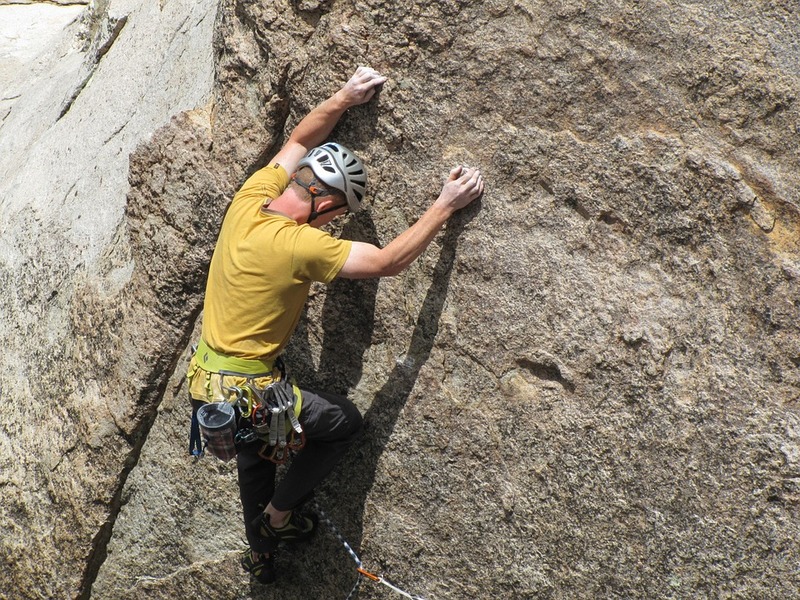 Since rock climbing is also about developing the strength of mind, traditional rock climbing does not have pre-determined pathways for climbers to follow in real life rock formations. Thus it is vital that the climber has some technical knowledge before performing this in the real world. After some training, ensure that you have the proper gear and your ropes have adequately latched onto the rock before making the first move! With a combination of versatility and difficulty, this type of rock climbing is best for those willing to go to extreme lengths when it comes to sports. A climber is supposed to go after more powerful jumps. This kind of rock climbing is all about pushing the body’s limit to the next level. Climbers should prepare for the many falls that they may face before an actual successful attempt. As the gear and tools are already attached to the rock formation before a climber begins, it is easier to go faster without indulging in too many mental calculations. This way of climbing is a test of strength and swiftness. Thus it is quite safer than the more traditional methods as well. As a climber has to exceed all boundaries of power they do not carry any equipment. Consequently, they can avoid the added weight which may prove to be an obstacle to their speed. Any true nature enthusiast would argue that the purest form of rock climbing is free solo climbing. No matter how practiced a person is, solo climbing is one of the most dangerous ways of ascension as there are no tools or equipment involved. A person is entirely dependent on their own hands and body strength in this type of climbing, so body strength is a paramount success factor. In case of solo climbing, experts advise that the person should only cover a small height before daring themselves to include an even tricky length. This sort of climbing indeed puts the climber parallel to death, so you have to do it when you acquire an immense level of experience. Remember how Tom Cruise’s moves in Mission Impossible. Solo climbing is exactly like that but in real life! People widely assume that indoor climbing would be less intense and easily accomplished by a beginner even. But this is such a wrong concept. Indoor climbing is as strenuous as outdoor climbing can be. The only difference is that you do it on a structure made of plywood or concrete. Indoor climbing also involves the same level of technical apparatus usage just like an outdoor climb would. It is just more strength oriented for those individuals who want to take up rock climbing as a routine workout. Aspiring climbers also take up indoor climbing before they can use more comfortable resort to rock climbing in the outdoors. One of the most significant advantages of indoor climbing is how there is some supervision available which beginners can count. An extremely tough and exhilarating experience can derive from this type of rock climbing as climbers are virtually caving their way up or down an ice formation. Typically targeting glaciers or frozen waterfalls, ice climbing is an ultimate wonderland for an adrenaline enthusiast. The cold combined with the intimidating passageway will surely make a climber think twice before going on such an adventure. Needless to point out, ice climbing also requires special tools which can bring some ease to the climber making such an arduous journey. Not only does a person need to acclimatize their body and mind to the harsh environment fully but they also need to go through the initial training. The initial training will prove to be death-defying in times of need. Ice climbing is every bit as daunting as perceived, so a person needs to show commitment to the cause and take all the necessary precautions. The professional ice climbers have had years of experience and knowledge which enables them to go for such adventures. A novice needs to get adequately trained beforehand. Another innovative way of climbing that has recently surfaced is bouldering. Here, a unique system of technique and strength combines. It makes relatively more accessible for the climber to make his ascent on buildings and non-rock bodies. Since the climber does not go at an immense height, there is no use of ropes, but a crashing pad places underneath just in case. A climber needs proper gear for bouldering as well even if it does indoors. Various buildings classify as per the level of difficulty. And a climber has to do his climb with no support whatsoever. Once again you can never emphasize the importance of acute training enough as there are risks involved in this climbing as well. This competitive nature of rock climbing calls for some severe authentication and supervision as well. Beginners should steer clear until they develop the relevant skills. Now that we establish the central types of rock climbing, it is crucial to understand the role proper gear has in this sport. Any sporting activity feels incomplete if it is without the right set of tools. The significance of proper paraphernalia is even more heightened in rock climbing as a person’s life depends on it. Understanding this clause will ensure the safety of a climber as well as his performance in the field. A perfect way of starting the journey is by cautiously preparing all the tools beforehand so that the climber does not miss out on anything significant. Other than some essential tools, there are added components to the whole rock climbing paraphernalia which can expedite the learning process for novices too. However, you should not compromise the quality on so do not be stingy and splurge on high-quality stuff. It is a matter of your life after all! You cannot go for rock climbing unless you have the perfect cord that can support you. Unless you are going for bouldering or some other technique which you can do without the use of rope, it is quintessential to prepare. The particulars of a rope genuinely depend on the journey a person is foreseeing. Universal length of the line is estimated around 60 meters, but it should incorporate the extent of the rock formation and then settled accordingly. Another crucial factor is the width of the rope as that determines whether it will be able to sustain a climber’s body weight or not. Roughly 11 mm of cord should be perfect for any climb. But it is best to consult an expert if you are planning a significant rise. Remember to tie and store the rope in a butterfly-coil shape to avoid any accidents. From the perfect shoes to the clothes, climbing also calls for some impeccable apparel. Climbing shoes are different from trainers so invest in a good pair right now! Your clothes should not only be comfortable but also be heat or cold resistant depending on the climbing climate. The purpose is to plan so that you can gather the best experience without worrying over minute details. An athlete’s performance reaches perfection once you pay attention to the outfit as its lack can seriously harm the future endeavor. Not only should clothes and sportswear protect an individual but also provide that extra vitality in their steps. If you pursue rock climbing competitively, the importance of the outfit increases tenfold. Go that extra mile and spend some cash as well if you want to invest time and effort. A climb might be incomplete without a proper set of harness which provides safety to the climber. Without a durable set of harness, it is not advised to go ahead with rock climbing. Not only does it serve the safety purpose, but also assist a climber in attaching several other gears to it. For added zeal, you might leave a harness aside, but this is only for the experts out there! No sport is worthy of risking your precious life so it always a good idea to be safe than sorry. Harnesses also come in a vast array of variety. So choose the one that best matches your skill set and your next climbing adventure. A belay device ensures that the rope is taut as per the climber’s preferences. It assists in the sport as it provides some added security and control to the climbers. You need to maneuver ropes carefully as they can knot up and lead to more difficulty than ease. This point is where a belay device comes in handy. By acting as a break, a belay device can genuinely save a person facing an impending fall and provide some control to his climb. Quickdraws have twin carabiners which can further assist a rock climbing adventure. The rope can run through these carabiners and provide some extra protection to the climber. For a climb, a person might need several quickdraws, but this honestly depends on the length of the rock formation. It is always a better idea to have several quickdraws at hand before starting the ascent as you might use all accordingly. This iconic tool used by most climbers is an essential part of the whole package. Rubbing some chalk powder on hands gives that extra sense of protection because it increases the level of friction. To enhance the grip and avoid any slipping accidents, it is always a good idea to prepare with some chalk. Sports climbing and bouldering does not incorporate other tools. Consequently, hands doused in chalk are an important priority. A chalk bag on the go is a great invention of keeping extra chalk safe and storing it while one is indulging in the activity of rock climbing itself. Similarly, it is essential to organize and rapt. Moreover, not just with the training but also when it comes to the tools and equipment. Taking some introductory indoor classes will further define the horizons for beginners especially. Rock climbing is an exciting and adventurous way of exploring this world’s beauty and one’s’ body strength so you must do it with immense enthusiasm and protection! Happy Rock Climbing!